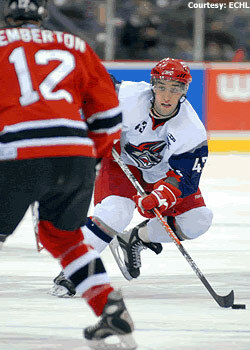 Benoit Doucet leads the Elmira Jackals with 27 goals and 68 points this season. Despite the fact that the Elmira Jackals are fighting for home-ice advantage in the Kelly Cup Playoffs with 10 games remaining in the regular season, coach Steve Martinson is doing everything he can to send his leading scorer to the American Hockey League. It's not because Martinson doesn't want rookie Benoit Doucet around. It's because the soon-to-be 22-year-old has earned a look at the Triple-A level. "He hasn't yet, but I'm confident we'll get him up before the end of the year," Martinson told NHL.com after Monday night's 5-2 win over the Wheeling Nailers at First Arena. "We've been so short the last month and a half that it's been tough to loan guys. "I'm sure he's a little bit frustrated that he hasn't got an opportunity yet, but we've had chances where we couldn't even have loaned to our own affiliate. We've played half of our games with 15 guys or less. But I think he's been an outstanding rookie." Doucet (5-foot-9, 183 pounds) leads the Jackals with 27 goals and 68 points. His willingness to take a hit drew raves from Martinson, who has coached every professional game Doucet has ever played. The rookie joined the United Hockey League's Rockford IceHogs for the Colonial Cup Playoffs after finishing his final junior season that saw him rack up 100 points with the Victoriaville Tigres. 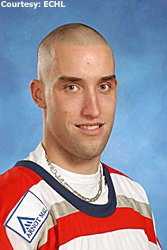 So when it was announced last summer that Martinson would be heading to the ECHL to coach Elmira, it made Doucet's decision a no-brainer as to where he would play in 2007-08. Despite numerous call-ups and injuries, Doucet's play has helped the Jackals stay afloat. Monday's win gave second-place Elmira a three-point lead over the Reading Royals as the teams battle for home-ice advantage in the opening round of the playoffs. "I played in Rockford in the UHL, but it's a little bit different," Doucet said. "The guys were younger. I was with Steve Martinson in Rockford, and he gave me a lot of ice time. He trusted me. That's why I came here. I knew I was going to get a lot of ice time and I knew that Marty knew what I could do on the ice. I just had to work hard, and he gave me my chance, and I took it." But could anyone have expected the rookie to lead the team in scoring with 10 games to go? Martinson isn't so surprised. He even has a nickname for Doucet when the latter has the puck on his stick in the slot. "He's not the flashiest player," Martinson said. "He doesn't always go end to end with the puck, but I call him 'Money' when he's got the puck at the top of the circle. I'm a big believer in puck possession and cycling. To play that style, you have to have gritty guys. We're not sitting in the neutral zone trapping. We like to get in there and forecheck and hit. He finishes all his checks." And while a fair number of players his size will shy away from going to the net to take a hit from a much-larger defenseman, Doucet is willing to pay the price. "Where Deuce is really good is he will hold the puck to make plays," Martinson said of Doucet, who was not drafted. "He's tough as nails. He'll take a hit to make a play. He's not afraid to bring it to the net in traffic and hold it to make something happen. A lot of guys that are 5-foot-9, -10, 180 pounds don't like to carry the puck into traffic the way he will." No question, his play in front of the net played a role during his remarkable season in Victoriaville last season. It was a breakout year of sorts for Doucet, who went from 68 points in 2005-06 to 100 (43 goals, 57 assists) last season. "I played with Morten Madsen, and he's playing in (AHL) Houston right now," Doucet said. "He's an unbelievable player. He's really good. We played together all year, and we played really good together. We helped our team finish second in our division. We lost in the first round (of the playoffs), but we had a great season. That was a great year for me." After racking up nine points in 15 playoff games for Rockford, Doucet earned a tryout with the AHL's Springfield Falcons last September. While that was his last taste of AHL competition, Doucet is confident he will get there sooner rather than later. "I didn't really know what to expect," Doucet of Springfield's training camp. "I'm going to be ready for next year for sure. I know what to work on. I just hope to get another chance and hopefully get some games up there." This season, though, isn't over yet. And with AHL Rochester mired in last place in the North Division, it could be a perfect fit for Doucet given Rochester's close proximity to Elmira. Doucet was asked if he's frustrated by the fact that he's yet to get the call from any AHL team. "Frustrated is maybe not a good word," Doucet said. "I'm disappointed a little bit. But the season's not over yet. Coach said I might get a chance to show what I can do up there. It's good for me to do good things this year. Next year is next year, and I just hope to get my shot. When you don't have a chance, you can't prove what you can do. I'm just trying to work hard. I'm sure good things are going to come for me."